Rahm Emanuel, right, and Police Supt. Garry McCarthy at the press conference ahead of the release of the Laquan McDonald video. CHICAGO — A yearslong rift between ousted police Supt. Garry McCarthy and city attorney Stephen Patton effectively derailed the former top cop’s efforts to make substantial reforms to the city’s police disciplinary system in 2013, top city sources told DNAinfo Chicago. The revelation of a behind-the-scenes battle between the city's top police officer and its top lawyer shines new light on the city's Police Department, which is under siege and under federal investigation in the wake of the Laquan McDonald shooting video. A top Police Department source said that in early January of 2013, McCarthy asked the mayor to appoint a blue-ribbon panel of experts to recommend sweeping reforms to how the city investigates police misconduct and disciplines officers. The source familiar with McCarthy’s pitch said the superintendent aimed to give the mayor justification to push for major changes to city laws and the police union contract, which was being renegotiated at that time, to make misconduct investigations more transparent. The changes also would have given McCarthy authority to discipline — and terminate — officers with sustained misconduct investigations. That conversation, which came on the heels of a City Council vote to settle two police misconduct cases for $33 million, led to the launch of a study related to preventing and disciplining police misconduct. The study, ordered by the mayor, was led by A.T. Kearney, a management consulting firm, and former federal prosecutor Ron Safer, managing partner of the Schiff Hardin law firm, at no cost to taxpayers. • Firing any officer engaging in a “code of silence” with little room for flexibility. • Establishing formalized misconduct discipline guidelines, which currently do not exist in Chicago. • Holding supervisors accountable for actions of their subordinates. • Tracking and monitoring officer misconduct. • Enabling the Independent Police Review Authority, better known as IPRA, to close more cases … and take actions against complainants who file false complaints against police. • Increasing transparency in the Police Department internal affairs office. • Limiting the Police Board’s jurisdiction to only serious allegations of police misconduct. • Instituting “education-based discipline” that experts believe helps teach officers how to make better decisions in the future. • Lengthening the disciplinary history of an officer that can be considered by the Police Board when doling out punishment from five years to 10 years. Darrell Stephens, executive director of the Major Cities Chiefs Association and a renowned expert in police discipline, was one of two experts who reviewed the findings of the study. Stephens told DNAinfo Chicago that he reviewed study documents and offered his input for the last time around June of 2013, and never heard a word about the findings again. “I thought it got lost in the bureaucracy of the city,” Stephens said. As things turned out, the report was released just before Christmas in 2014 without any fanfare. A copy of the findings is buried on the “safety programs and initiatives” page of the city’s website — a single sentence with a link. At the time of the release, the Sun-Times was the only news outlet to report that the study was completed, in a short story under the headline “Report: City cops should be fired if they engage in ‘code of silence.’ "
That anti-violence report, which focused on youth violence, was long on proposals for expanding summer jobs, creating “peace rooms” in public schools and bolstering after-school and mentoring programs. It did not contain any Police Department reforms, particularly related to disciplining officers found guilty of engaging in misconduct. City attorney Patton worked on the report. Patton, a high-powered litigator who negotiated a $206 billion settlement with Big Tobacco before joining the Emanuel administration as corporation counsel, and McCarthy often clashed on Police Department policy. Their feud dates to arguments about McCarthy's plans to handle protest marches during the 2012 NATO Summit held in Chicago, city sources said. McCarthy had made it clear to the administration, Police Department and City Hall, sources said, that it was his opinion Patton was a “major roadblock” to winning the kind of reforms needed to fix the broken police disciplinary system. Both the police discipline study and the "Safer Chicago” commission's report were released about a month after the police union contract was ratified by the rank and file, a move that the Sun-Times declared guaranteed “pre-election labor peace” for Emanuel. The mayor declared the new union contract a financial win for taxpayers, but the deal did not include reforms to contract rules about releasing information about officers charged with misconduct or other reforms, according to published reports. 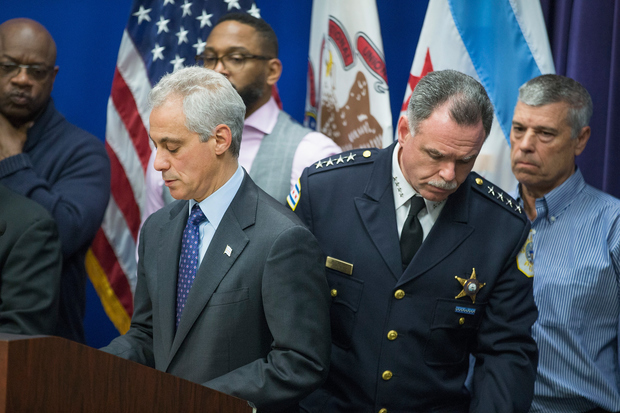 The Emanuel administration declined repeated requests to interview Patton and did not respond to more requests to discuss the release of the A.T. Kearney police disciplinary report and why the mayor decided against following those recommendations. Asked to comment for this story, McCarthy declined. On the same day, Emanuel appointed a “task force on police accountability” charged with making a “top-to-bottom” review of the police disciplinary system and ordered it to report back to him by early spring. When announcing the task force, the mayor didn’t mention the A.T. Kearney report, which took two years and covered how Chicago police brass, the Police Department’s bureau of internal affairs, IPRA and the Police Board operate. "We appreciate the hard work by Ron Safer and the team of individuals he worked with on a review of the disciplinary system. Because of their work, a number of reforms were made to improve the measures by which we hold officers accountable. But it has become clear that there is more work to be done, and the Mayor looks forward to the recommendations of the Task Force." On Wednesday, though, Emanuel will face the public again. At a special City Council meeting, the mayor is expected to lay out his plan for police reform in hopes of rebuilding trust in the Police Department.